You're out with some business friends & the group decides to go for an impromptu Italian meal - but you've accidentally left your credit cards at home. Since there's no charge to receive money if it's from friends, most of the group have already grabbed their own personalised Paypal.me link, and the leader sends you his Paypal.me link for your share of the meal via text. You've just introduced a new B2B service and you're with a prospective client who really seems to want to trial the system today, but you're not entirely sure they're being serious. You could create a Paypal.me link "on the fly" as you're talking with them as way of checking where they're at: "Tell you what, let me text you a trial link where you can run with our full system for 30 days, and then you'll be in a much better place to see if this is really a good fit for your business". ...this is obviously just the tip of a very large iceberg in terms of how Paypal.me could be used. But you can already see that with a bit of preparation on your part, you can leverage Paypal.me in all sorts of creative ways to help with better cashflow, give new clients a low risk way to get on-board, and a whole bunch more. How about a tip jar for Bloggers, with a Wordpress plugin that gives the reader an Ajax-based dropdown where they select the amount they want to tip and then pay via Paypal.me in just a few clicks)? Or maybe something similar to the above for a yard sale, or even you're own Etsy-style "pay what you reckon" e-commerce page, where visitors can choose from a range of prices? What ideas can you come up with that will help your business using Paypal.me? Text: youtubeusa to 4042208111 (USA-Canada) or youtubeuk to 02033221176 to schedule a FREE 30 minute sms marketing consultation with me. Twilio sms in the UK is now live! I've been using Twilio sms since last November, and in December of last year I worked with 2 JV partners to launch some Twilio SMS software which is very easy for businesses to use. This is great news for small businesses who want to use sms lead generation & other sms marketing strategies, but up to now the costs have been prohibitive: Twilio is charging 4cents per message, and you can rent a number for just $1/month. Twilio has been called a disruptive technology by many, and although it's not the only kid on the block (its competitors include Tropo, Nexmo, Trumpia and a host of others), it's one of the few companies who I believe have enough zeal, investor backing, and vision to push forward sms & IVR-based telephony services for Small to medium sized companies. Twilio is no small fry though, and its infrastructure is designed to be robust enough to meet the demands of the Big Boys. Although the main front-end focus of the company is sms and voice communication, Twilio offers a very comprehensive call distribution with an Interactive Voice Response capability - so that any business can get access to these services. So what does that mean for your business? You now have access to cost-effective sms customer followup and sms marketing tools in your hands at a very affordible price point. So how can Offline Snatcher help Me? Quick Answer: Because this is a method that really does help you find offline clients very easily. See the next section below to find out more. So, what's in Offline Snatcher, then? Tell me more! When you were generous enough to allow me a sneak peek into this, I was expecting it to have some content for sure, but nothing like this. You have a great teaching style and make it super simple for anyone of any level to jump on this. The mods are packed and I LOVE the summary section you provide below each video....makes for very easy access when you need to go back and review. Thanks for all the relative links you provide, and especially your Closing The Deal and Upsell Strategiessections! I'm not going to go into major detail because there's no reason to spill this method. It is wise investment for anyone involved in offline at all. The proceeds are going to a much needed cause. You are a super guy for looking out for your fellow neighbors on this planet. Way to go Dez....you hit a homer with this one! You can tell who is genuinely working "in the trenches". If you take a look at some of Dez's posts in othersWSO's you will see that he ask searching questions of the product owners, and lots of little tips n tricks in other posts. And, if you know someone is walking the walk, you can be sure that the strategies shared are tried and tested. And these strategies are VERY cool. Not only are the leads Red Hot, but they'rereally FRESH too! So couple the lead gen strategies with Dez's follow up training and you're on a sure fire winner. Apparently this is Dez's first WSO... It's put together beautifully, like a seasoned pro. Wow. I have been bursting at the seams in excitement to talk about this course. We know by now that all great ideas are simple ones. This idea is not just brilliant, but quite simple and to be honest, elegant. And profit going to charity to boot? Get on this, help the needy, use the information, and make some money. Sounds like a great idea to me! Super-simple method for finding hot leads in offline business. I mean really simple, easy to implement and easy to follow through. That's the first video in module 1. If you're an experienced marketer, you could stop right there and be good to go -- and have another very effective leads-gen method to add to your client-getting arsenal. But that's the course's *starting* point… The course is 4 complete modules. After you learn the basic Offline Snatcher Blueprint, Dez shares detailed strategies to less experienced marketers or simply marketers who want an over-the-shoulder view of someone who's already "doing it." How to avoid cold calling the business, how to approach, services to offer, outsourcing ideas... Some of this will be familiar but overall a very useful WSO. Information provided for US, UK, Australian and many other markets. If you're an offline marketer who wants to add more clients to your business, you will find useful strategies and practical hands-on steps to follow. His course is a recommend. I was going to keep quiet about this. But I'm spilling the beans about mobile marketing instead. The reason? Well, just as social media (Facebook & Twitter mostly) has become mainstream, so too will mobile marketing within a very short space of time. You might already be using it for your business. If so, just say "Pah!" and move along to more important things now. 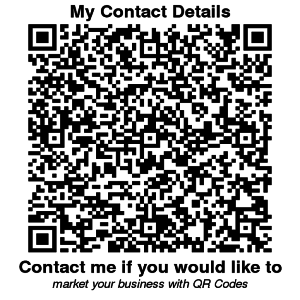 If you're not yet using mobile marketing - which can include QR codes - then I reckon your business will be missing out big time, not too far in the future from now. Oh, by the way, if you're still not using Twitter & Facebook (AND YouTube in my opinion), then you should also stop reading now. Get on the phone and give me a call, and I'll show you how you can create a simple Facebook fanpage for free. So, then, what's all the fuss about QR codes? Well, about 6 months back, I was passing an Estate Agents (or Real Estate 'shop', if you're not from the UK & reading this!). And it had a QR code attached to the shop window. So why would a place advertising Real Estate do that then? Well, if you have a smartphone (and in N America approx. 29% or so people now have one1), you are - at least at the present time - 72% likely to respond to the presence of a QR code in a newspaper, shop window, or some other form of advertising, according to a recent QR usage survey2. So what does that mean for you, if you run a business? With smart phones rapidly becoming the norm within the next few years, you are at a big advantage if you can position your business at the head of the game. And I haven't even begun to talk about ways to combine QR codes, SMS short codes and email marketing into a seamless sales funnel yet. And how about combining all THAT with your Facebook Fan Page, Twitter feed and YouTube channel? You have got those, right? If not, maybe we should have a conversation, (or Tweet or text!). I'll be detailing more ideas that you can steal from this site soon, so stay tuned! Lastly, if you want to make one of those pretty patterns above, visit the QR Code Generator page now. The best innovations are sometimes both simple to grasp, elegant in the solution they create, and almost always obvious in retrospect. Simple to grasp, elegant and super-quick to set up. You’re a business growth consultant who charges £120/hour, offering some freemium content on a Google Hangout or Periscope to a targeted group. At timely moments during the valuable free group session, explain that for one on one sessions, viewers can take advantage of a 30 minute “special” where you’re offering to help them move forward, at a 50% discount: http://paypal.me/yourname/30. Or perhaps instead, if they want to take the next step, you could send them to http://paypal.me/yourname/1 for a £1/$1 trial for a 15 minute session. You’re out with some business friends & the group decides to go for an impromptu Italian meal – but you’ve accidentally left your credit cards at home. Since there’s no charge to receive money if it’s from friends, most of the group have already grabbed their own personalised Paypal.me link, and the leader sends you his Paypal.me link for your share of the meal via text. You’ve just introduced a new B2B service and you’re with a prospective client who really seems to want to trial the system today, but you’re not entirely sure they’re being serious. You could create a Paypal.me link “on the fly” as you’re talking with them as way of checking where they’re at: “Tell you what, let me text you a trial link where you can run with our full system for 30 days, and then you’ll be in a much better place to see if this is really a good fit for your business”. …this is obviously just the tip of a very large iceberg in terms of how Paypal.me could be used. But you can already see that with a bit of preparation on your part, you can leverage Paypal.me in all sorts of creative ways to help with better cashflow, give new clients a low risk way to get on-board, and a whole bunch more. How about a tip jar for Bloggers, with a WordPress plugin that gives the reader an Ajax-based dropdown where they select the amount they want to tip and then pay via Paypal.me in just a few clicks)? Or maybe something similar to the above for a yard sale, or even you’re own Etsy-style “pay what you reckon” e-commerce page, where visitors can choose from a range of prices? What ideas can you come up with that will help your business using Paypal.me? Twilio Sms in the UK – Now LIVE! Although the main front-end focus of the company is sms and voice communication, Twilio offers a very comprehensive call distribution with an Interactive Voice Response capability – so that any business can get access to these services. The mods are packed and I LOVE the summary section you provide below each video….makes for very easy access when you need to go back and review. Way to go Dez….you hit a homer with this one! Apparently this is Dez's first WSO… It's put together beautifully, like a seasoned pro. Super-simple method for finding hot leads in offline business. I mean really simple, easy to implement and easy to follow through. That's the first video in module 1. If you're an experienced marketer, you could stop right there and be good to go — and have another very effective leads-gen method to add to your client-getting arsenal. But that's the course's *starting* point… The course is 4 complete modules. After you learn the basic Offline Snatcher Blueprint, Dez shares detailed strategies to less experienced marketers or simply marketers who want an over-the-shoulder view of someone who's already "doing it." How to avoid cold calling the business, how to approach, services to offer, outsourcing ideas… Some of this will be familiar but overall a very useful WSO. Information provided for US, UK, Australian and many other markets. Social Media? How About Mobile Marketing? If you're not yet using mobile marketing – which can include QR codes – then I reckon your business will be missing out big time, not too far in the future from now. Well, if you have a smartphone (and in N America approx. 29% or so people now have one1), you are – at least at the present time – 72% likely to respond to the presence of a QR code in a newspaper, shop window, or some other form of advertising, according to a recent QR usage survey2.